If an existing comment marker is found an edit box comes up for reading/editing. If no existing marker is found then an empty edit box comes up so you can add a new comment. In that case a new comment marker is added on the current line. 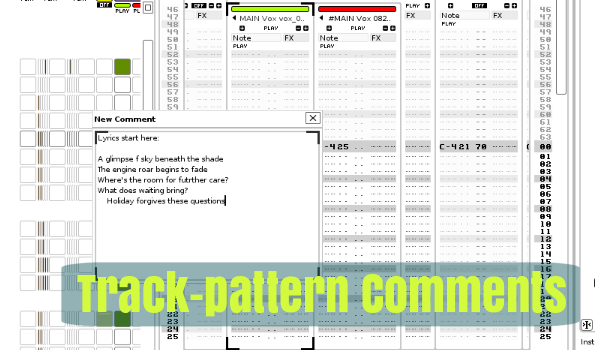 The code assumes one comment marker per track pattern. You have to use the tool to create new comments and add the custom fx entry. This is the only way for the tool to keep track of comments and their associated storage in the the song comments. The tool does not have currently a way to delete comments. You can of course just delete the fx entry in the track pattern but the comment content remains with all the other comment content.